Niche, or necessary? If you run a small or medium-sized business you should make sure you aren’t missing local opportunities when people ask Siri to find services you provide, then you must add your business to Apple Maps. Apple Maps gets reviled, but it is still the ninth most popular app with 42 million users. (Google Maps is sixth, with 64.5 million users, down from 81 million in 2012). Voice search (using assistants such as Siri) already accounts for over a billion searches each month, most of this for local requests. When Siri is asked to search for a business it will consult multiple data sets, including web search results, business review sites, and Apple Maps. This means that ensuring information about your business is available on Apple Maps may help potential customers find your business. It also means that if you aren’t listed on Maps but your competitor is, they will get that customer. This is going to become increasingly important. Gartner claims around 30 percent of all web browsing sessions will take place without using a screen in future, meaning three-in-ten searches will rely on whatever the first result is that the search agent provides. Apple’s Maps Connect portal lets small companies submit and edit Map listings for their business without needing to engage with Apple. The aim of the service is to make Apple Maps more competitive with Google Maps in local search and helping customers find local shops and services. As part of this attempt, Apple has also invested in mapping companies Embark, Locationary, and HopStop. Apple acquired Embark and HopStop in 2013 in order to roll knowledge of local mass transit, taxi, bike, and routing directions, but Locationary offered services of more direct interest to business users, as explained here. You’ll need to register for the service first. Visit Apple’s Maps Connect page and sign in using your Apple ID and password. If you don’t have an Apple ID you will need to set one up. 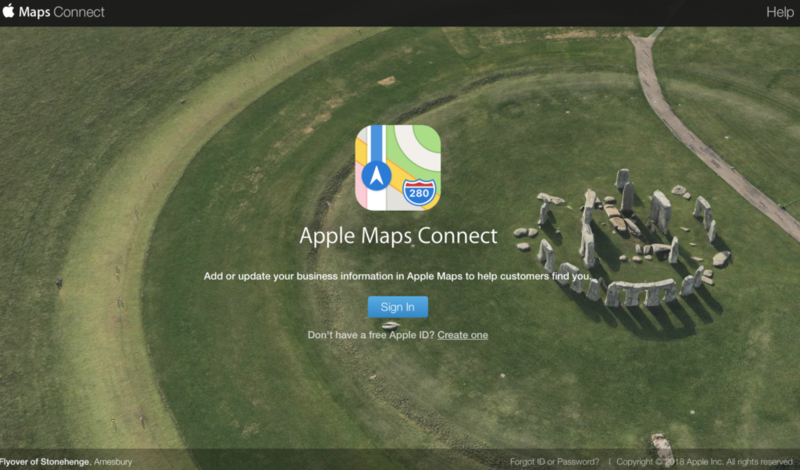 Once you have an Apple ID you can sign into Maps Connect. You’ll be asked to review terms and conditions. There’s lots to this, but one of the biggest implications is that you must ensure you own any images or other assets you provide that relate to a business. You must alsoagree what you submit may be used within products and services provided by Apple, its affiliates, partners, licensees and third party developers and shared with third-parties. On the Maps Connect page you’ll be asked to search for your business by name. If it can’t be found (because you’ve not added it) you then tap the Add New Business button. You’ll be asked for the place name, country, phone number, business status (open, moved, closed), business categories and if Apple Pay is accepted at the premises. If you search for a business and find it you can claim the business as your own. If it isn’t yet added, you’ll claim it as you set its business listing up. To claim, you’ll need to choose the correct location, add business hours, add your website, links to any Facebook, Yelp or Twitter URL’s, your business name, relationship and so on. It’s a really good idea to do this as it enhances search results for your service. Once you’ve added all this information you can tap Continue to submit your listing to Apple. You’ll receive the confirmation phone call and you will see your business added to Apple Maps listings once Apple’s reviews team has verified the information you provide. This process can take a couple of weeks. You’ll also need to agree to verify your claim by telephone, or press ‘Not Now’ to delay verification to a more convenient time (though this won’t happen until you do verify your claim). Verification consists of a verification code Apple calls you to provide. Once you have verified that you own your business you can edit information such as your address, business hours, precice location and other details. There are numerous online services who claim to offer you the help you need to get your business listed on Apple Maps and dozens of other online directories. Improving the search position of business search results in Apple Maps remains a pretty dark art, though you may find some ideas here. In general terms, Maps and review sites listing activity needs to be supplemented by other ways of getting your business identity out there: blogs, local reviews and a presence on locally-focused websites should help, for example. Thanks for your post. It never dawned on me that Maps also sported this service. I’m curious to see the difference in implementation between Google for business and Apple. Thanks ever so much for writing Leo. Yes, I do think it is important, and yes I do think it’s necessary for SMEs to get their heads around local search. Hi there and thank you so much for this article. Do you know if it’s also possible to add photos to your listing? I can’t seem to find it, and I see that it currently pulls the photo it has from Yelp. needless to say, it’s not the one I’d prefer. So if there is a way to add my own, that would be great. I think you have to speak to Yelp to try to get the image used updated. You probably need to find out what criteria are used by Yelp to choose that image, and then probably use some SEO tips to try to replace that image with a higher performing image in search. We have a phone tree and the phone call verification won’t work. What do you suggest? This is absolutely ludicrous. There are only a few countries available when you want to add a place. What in heavens name is Apple thinking here? I have a problem, because there is no possibility to put location in Republic of Croatia (Europa). Please could you help me.